Day 3, and only 3 more to go, but here are two more questions and answers, one from an Occupy Oakland participant and one from an Occupy Indianapolis participant. This series has been an attempt to clear the air for those of us that have lost interest and no longer give our attention to the news coverage of the Occupy movement due to being overwhelmed and burned out by the frequency at which they report. I hope this is helpful and as always please let me know if you have any additional question as both ladies are kind enough to take on more. Read on. 3. Is this Occupy movement the next gen tea party? The tea party participants and occupiers are upset about many of the same problems. I love to hear stories where occupiers and tea party participants come together to share in a respectful dialogue and focus on their similarities. However, conflicting ideologies may not ever allow liberals and conservatives to see eye to eye, but I would encourage conservatives and everyone really to pick out parts of the movement they support. I don’t like to see this movement as the Occupy vs. the Tea Party, because this is not about officials, about the left or the right. It’s about the fact that our government is bought out and our voices are not being heard. So if these voices want to say liberal, conservative or a third party, it is really irrelevant because our official’s operate in a system where they have to do whatever the person with the most money tells them to do, it becomes confusing when that person happens to support a conservative agenda and now it looks like a left and right issue again. But it’s not supposed to be about that. This is another stand most cities support, that we do not affiliate with any party. Our agenda is not to get a person in office, but rather just change how the office operates, change the system which right now isn’t working. 3. 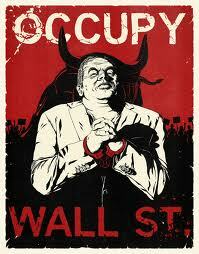 What has been your involvement with Occupy? I'm on several committees, most notably the media committee. We're still a very new movement, but we're building infrastructure. The media committee mostly fields interviews from outside media, does our social networking, captures footage of events and General Assemblies, and we just started a blog. Thanks Jacob, I appreciate you reading.